Hello, and welcome to Mary's Adventure Sweater. Today we'll be discussing gauge. Because I'm mixing yarns I found I had to drop a needle size in the self-striping yarn to match the stitch sizes, and that means my stitches per inch will be particularly important during the Adventure. 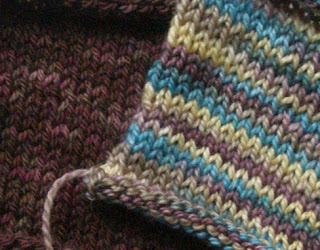 I don't have a lot of yarn to work with and short of lace, stocking stitch gives you the most mileage. 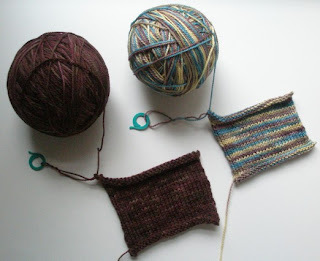 I'm using two very beautiful self-patterning yarns that will stand alone without cables or fancy stitches. The structure will be complicated enough without keeping track of cables and fancy stitches. Size sort of matters here. You should probably make your swatch 6-8" square so you can really see what you're getting into, but I won't tell if you cop out at 4" because that's what I did too. Then start the row and keep knitting until you hit the knot. That's how many stitches you get per yard. Later on, if you decide you want to add more pieces - sleeves, for example - you can use a yardage calculator to help determine how much you'll need. When you do your wet blocking, you'll be able to keep the ball of yarn and maybe even the loop out of the water. But wait! Don't wet block yet! 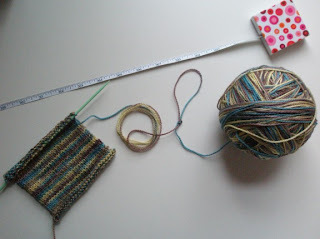 First, measure the swatch for stitches and rows per inch. Okay, now you can wet block. 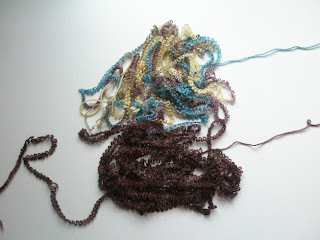 Technically, you want to dry the swatch as you would the finished sweater, perhaps clipping a bag of marbles to the bottom and hanging up if you think it will be heavy and stretch out. If you don't like how it looks, you get to start all over again. When the swatch is dry, check the stitches and rows per inch again. Spot any difference? My two swatches shrank just the teeniest bit, which tells me I should err on the side of big when eyeballing how many stitches I want to add in as I go. and when I was done trying to decide whether this one looked more like a Chinese dragon or a sailboat in a storm, I rolled them loosely back into balls. My evil plan is to let those two balls sit and go flat again for a while while I knit with the other ball in each colourway. I'd worry about whether or not that will work if this wasn't all meant to be an Adventure. Well, that's about all we have time for today. I hope you've enjoyed today's look at gauge, and that you'll tune in next time for Measurements.